Artists often go too far. Sometimes it can seem that any art worth its salt has to do just that, to show some form of excess, to do something inordinately repetitive, or of course skilled. Jakob Dahlgren’s thirteen year-long durational project will have many scratching their heads, asking what is the point? But to provoke that very question seems to be the point. 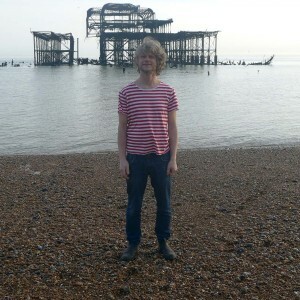 The Swedish artist has worn a striped t-shirt every day since 2001. There’s not much more to it than that. Although, apparently, he invites people to ‘curate’ the wardrobe for him. It might not sound too impressive. He has an archive of 1000s of numbered shirts. He has as many photos on an Instagram site. But the work’s very lack of gravity could indeed be his point. Dahlgren calls the work Peinture Abstraite and that smattering of French is not putting on airs. It is rather puncturing the work of those who have been historically content to paint coloured stripes. People are still painting stripes. In austerity Britain they are probably at it right now. And Dahlgren compares this no doubt serious endeavour with just so many sartorial decisions. He wouldn’t name names, but the artist said he drew inspiration from a range of artists whose work he didn’t very much like. He doesn’t like them, but they engage him. In turn, you might not like his t-shirt project. But if you are reading this, it is hoped that Peinture abstraite has engaged you in some way too. It fights fire with fire, decoration with decoration. And the fact he has just gone too far with the t-shirt idea, sporting them at weddings and funerals alike, just makes me warm to this deceptively simple piece. For the stripe painters out there, fear not. Dahlgren is not above picking up a brush, dusting off a worn t-shirt and painting what he sees. There’s no getting away from it. Peinture Abstraite can be seen at Fabrica, Brighton, until 26 May 2014. Check out Dahlgren’s Instagram site for more images and see the artist’s website for more info on the project.